Hi Casey, I know Fr. Brian Smail, via email only, and you’re right, he is doing a great job. I’ve really been reading about your journey. I go to Holy Angels in Little Falls, and we used to be a Franciscan parish.The friars were such an important part of my spiritual formation. I see so many of the things that I loved about the friars in you, and I know that you are going to be a WONDERFUL friar. I threw a link to your blog up on my Facebook page, and will do so from time to time. As you’ve indicated, you just never know where a friar is going to come from. God bless you as you continue your journey. You bring me great joy and stir in my heart the spirit of St. Francis. Casey, unfortunately, I don’t know any prospective friars. However, I think you have chosen the best possible vocation. 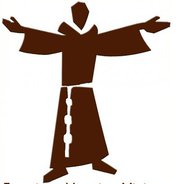 The Franciscans are great. Keep on blogging. Great blog, Casey! Hey, it sounds so good I’d sign up if I weren’t married, female and have 7 kids!!! OK, OK, I KNOW there are the 3rd order secular franciscans! I’ve been told by all my 3rd order secular franciscan friends! … more than once! However, right now, at this very busy time of life, a little time away in a “cell” of my own wouldn’t be such a bad thing 🙂 Peace and all good things to you.